The All Progressives Congress Governorship candidate in Lagos state, Sanwoolu has picked Dr Kadri Obafemi Hamzat as his running mate. Lagos Party chairman Balogun, 3rd left presents Hamzat as the deputy governorship candidate for APC. Sanwoolu, governorship candidate is 2nd left. Former Lagos State Commissioner for Works and Infrastructure, Dr Kadri Obafemi Hamzat has been announced as the running mate to Mr Babajide Sanwo-Olu, governorship candidate of the All Progressives Congress. 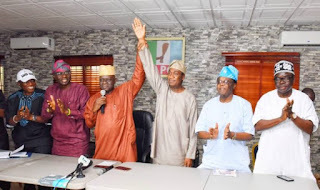 The Chairman of the party in the state, Alhaji Tunde Balogun announced Hamzat’s choice at a news conference on Sunday at the party secretariat, Acme Road, Ogba area of Lagos. Sanwoolu also tweeted the choice and presentation: After consulting widely with stakeholders and our political party, I am delighted to announce Dr. @FemiHamzat as my Deputy Governorship candidate. With this decision, Lagosians should be rest assured of the best as we will work assiduously to transform every aspect of our lives. The presentation only formalised an open secret in the state. Hamzat had been the preferred choice of the leaders, after he stepped down in the governorship race for Sanwoolu late September. Balogun said Hamzat was selected after wide consultations by the Apex decision making body of the party with other important stakeholders. The highest decision making body of APC together with all the relevant stakeholders of APC in Lagos State have endorsed Dr Kadiri Obafemi Hamzat as the running mate to the candidate of APC in Lagos State, Mr Babajide Sanwo-Olu. “After the endorsement, it is important for me to publicly and officially present Dr Kadiri Obafemi Hamzat as the running mate of our candidate, Mr Babajide Sanwo-Olu for the 2019 gubernatorial election in Lagos State,” he said. 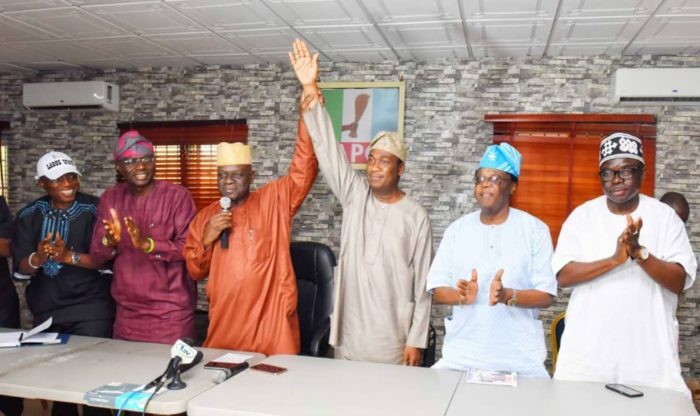 Sanwo-Olu, commended the choice of Hamzat as his running mate, expressing confidence that the former Commissioner would help realise a better Lagos. He said he had known Hamzat for years personally and professionally and that he could vouch for his competence and integrity to help deliver a better Lagos. “Dr Obafemi Kadiri Hamzat and I have been players in the same political matters for many years. “We have been friends and brothers for close to two decades and he is a man of deep intellectual knowledge. He is a man of high level of integrity. “He is competent and I know he is going to help greatly to deliver the Lagos of our dream. With a technocrat like Hamzat, we will take Lagos to the next level,” he said. In his acceptance speech, Hamzat thanked the party for choosing him and Sanwoolu to fly its flag in the elections. He said he and Sanwoolu knew what was required to deliver a better Lagos, promising to do his best if the party gets the mandate. “Lagos is dear to all of us and If Nigeria will be great, Lagos must be great. And as such the party decided to look for somebody who has the experience to run the state, in the person of Mr Sanwoolu. “We are now a global village and what we do in Lagos affects everywhere in Nigeria and other parts of Africa. “So, I am very happy. I feel very happy and I feel a sense of responsibility that the party after sitting together, have selected me to be his running mate so that we can work together with our experience. “We have known each other for over 15 years professionally and personally. So, we have the chemistry and I dare say that we understand the geography of Lagos. “Mr Sanwo-Olu and I understand what it requires to cook what Lagosians desire. So, we promise to do our best to deliver the Lagos of our dream,” he said. Hamzat, son of a political juggernaut in the state, Alhaji Hamzat, was born September 19, 1964. He graduated from the University of Ibadan in 1986 with a degree in Agricultural Engineering and subsequently furthered his studies at home and abroad, resulting in both an MSc. in Crop Processing Engineering (1988) and a Ph.D. in System Process Engineering (1992). Sequel to this, he garnered about two decades of work experience in several organisations, including the City of New York, RTP Consulting Services, Columbia University, Merrill Lynch Inc, Morgan Stanley and Oando Plc. In August 2005, Hamzat was appointed Commissioner for Science and Technology during the tenure of Asiwaju Bola Ahmed Tinubu. He retained his position when Governor Babatunde Fashola assumed office in 2007. It was during his tenure as Commissioner for Science and Technology that Hamzat enforced the application of modern technology in the state’s ministries, thus changing the face of data and record keeping in Lagos and at the same time eliminating the trend of state ghost workers. It is reported in some quarters that this single act was largely responsible for his elevation as Commissioner for Works and Infrastructure at the commencement of the second term in office of Fashola’s administration. The office had gone on without a commissioner during Fashola’s first four years, with only a Special Adviser reporting directly to the governor.